A foul tip usually constitutes a batted ball fouled directly from bat into catcher's glove, but did you know that a foul tip doesn't actually have to be held in the glove in order for it to be a foul tip? Every blue moon or two, an anything-but-routine foul tip comes across on a ball caught by the catcher using a part of his body other than his glove to hold onto the baseball. Pursuant to Official Baseball Rule's Definition of Terms, "A FOUL TIP is a batted ball that goes sharp and direct from the bat to the catcher’s hands and is legally caught. It is not a foul tip unless caught and any foul tip that is caught is a strike, and the ball is in play. It is not a catch if it is a rebound, unless the ball has first touched the catcher’s glove or hand." Rule 5.09(a)(2) Comment clarifies this even further: "If a foul tip first strikes the catcher's glove and then goes on through and is caught by both hands against his body or protector, before the ball touches the ground, it is a strike, and if third strike, batter is out. If smothered against his body or protector, it is a catch provided the ball struck the catcher's glove or hand first." A foul tip bobbled and held onto by the catcher: Strike 3, out. 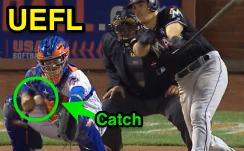 All this brings us to Sunday Night Baseball and Mets catcher Rene Rivera's unconventional foul tip in the top of the 9th inning on Marlins batter JT Realmuto's 2-2 swing that connected with the baseball, sending it sharply and directly to Rivera, who bobbled the baseball before pinning it to his body (see photograph above with ball resting in crook of Rivera's arm, smothered against the side of his chest protector) and retrieving it with his bare hand. Replays indicate the ball never touched the ground and never became lodged in Rivera's clothing or paraphernalia. For home plate umpire Tony Randazzo, the fun had just begun, as Marlins Manager Don Mattingly attempted to file a Manager's Challenge with Crew Chief Gerry Davis before being informed that foul tip calls were not subject to Replay Review. Had the batted ball not first struck Rivera's hand (or glove), it would not have been a foul tip, and, with two strikes, would be subject to standard catch rules granted to ordinary foul balls ("A CATCH is the act of a fielder in getting secure possession in his hand or glove of a ball in flight and firmly holding it; providing he does not use his cap, protector, pocket or any other part of his uniform in getting possession"). This is not to say that a fielder must solely use his hand or glove to catch a ball and that any other possibility is illegal. Many a pitcher, for instance, has legally caught a batted ball through the use of the legs and feet: baseball's CATCH rule is simply referring to the intentional use of a non-natural textile (such as a ball cap's bill or pants pocket) in order to modify the ball's trajectory to create an unfair advantage. If a ball is struck into a fielder's midsection, for instance, he can still capture the ricochet for a legal catch, provided the ball has not struck the ground, and he does not subsequently use a part of his uniform in getting possession. In the catcher's case, using his chest protector would render the play a foul ball.